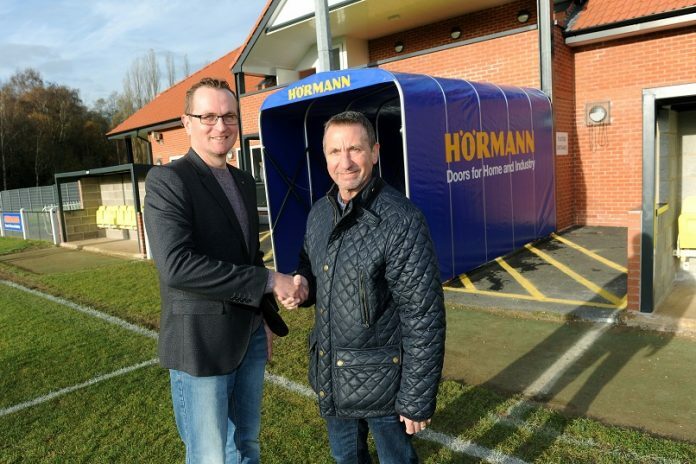 Coalville-based door manufacturer Hörmann UK has announced a deal to sponsor Coalville Town FC this season. The sponsorship deal will help with many aspects of the club and has already helped fund the players tunnel and new hoardings around the pitch. As well as this, Hörmann will also be supporting the football club’s first team and under 12 Ravenettes. David O’Mara, marketing manager at Hörmann UK, said: “It is great to be able to sponsor Coalville Town Football Club. The club makes a valuable contribution to community life and getting youngsters into football, so we are pleased to be able to give them our support”. Glyn Rennocks, chairman at Coalville Town FC, said: “If it wasn’t for companies like Hörmann sponsoring local sports teams and clubs like ours, we simply wouldn’t be able to operate and do what we love. So on behalf of the club, I’d like to thank the team at Hörmann for their generous sponsorship”.